This pub has just been refurbished and looks quite nice. However, the staff have a real ' we're the new place to be and don't need your custom' attitude. We walked in at 1pm on Sunday for lunch only be told all 250 meals for the entire day had been fully booked. Despite being empty. When I suggested to the manger this was slightly bad planning and he could've kept some free for walk ins he simply smiled and said ' we're fully booked mate'. My friends and I, who all live locally, will not be going back. Well I guess you can't please everybody. WE wandered in here on saturday to go the toilet! Had a drink while I waited for my wife and immediately noticed how warm it was compared to the day outside. A big open plan pub with a fire at one end. Most of the tables were taken and food was served until 9pm. Had half pint of Directors and a full pint of Youngs Special. Not a lover of Youngs beers as they generally don't do anything over 4.5%. However, I enjoyed what I had and even stopped for half chicken and chips and the 6oz burger and chips. Perfectly ok and my wife even remarked she'd like to come in again. It's true, there were blokes at one end cheering on the rugby whilst at the other end horse racing took centre stage. But it was all good humoured and I'd be quite happy to pop in on my own should I be in the area agaIn. Stopped in here for a lucky lager after a curry at the Lahore Karahi across the road. The best I can say is that it broke the walk back to the Tube station. It's a pretty big place and there must have been 10 punters in max. Okay, it was a Monday evening but The Antelope was nicely busy on the same night. No atmosphere at all and the music didn't help (EMF and Metallica?). The beer was decent enough but considering how much we'd enjoyed The Antelope earlier I can't think of a single reason why I'd ever go back to The Castle. I held a party in the Castle's function room last night. 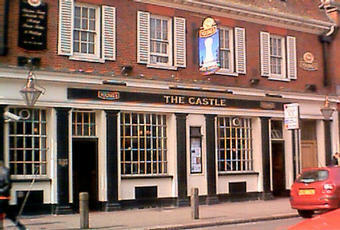 They did a good buffet and everyone seemed to enjoy themselves, so well done to the Castle and their staff. Good decent old fashioned pub, friendly staff, good Youngs real ales, mixed group of customers, worth a visit if you are in Tooting.